When it comes to shooting sports, and competition shooting, we’ve come a long way from the sticks and spears of the early days. Today, you will find that the most popular round among competitive pistol shooters is the 9mm. The 9mm round, known by it’s SAAMI designation as the 9mm Luger, was created by Georg Luger in 1902. It was created in response to a need for a round that had enough stopping power to bring down a criminal while helping to reduce the cost per round. Additionally, with the popularity of semi-automatic pistols on the market, weapons manufacturers needed a round that could chamber easily in this format. Before long, military organizations and law enforcement agencies all over the world were adopting this caliber as their primary weapon. 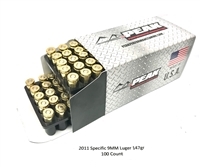 With regards to pistol competitions, the 9mm is popular primarily due to it’s low price and ample availability. Beyond factory rounds, the elements to reload 9mm rounds are readily available, as is load data for any aspect of shooting one might need. 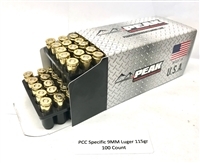 In fact, the 9mm has more information available for handloading than nearly any other caliber. Because of the round’s popularity, firearm manufacturers offer nearly infinite possibilities in a 9mm pistol. For beginners, there are several “out-of-the-box” pistols (meaning straight from the factory with no aftermarket modifications) available, as well as additional enhancements available to the expert shooter. This all makes the 9mm the go-to gun for any shooter looking to “get their feet wet” in competitive shooting.